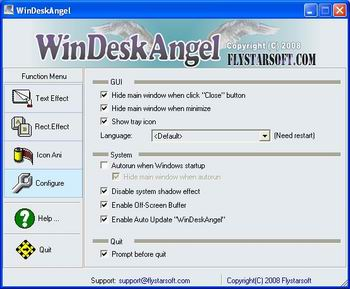 WinDeskAngel is a Desktop Utility for Windows. It can make some amazing effects for Windows Desktop and let your Desktop be full of energy. In Windows XP, when a Desktop Icon Item was selected, a drab rectangle will be paint around the label of the Item. WinDeskAngel could add some cool effects to the Selection Rectangle. WinDeskAngel supports paint Selection Rectangle with half-transparent mode and five styles. From earliest Windows version to current version, the icons in desktop are all static. Do you feel a little bit drab? WinDeskAngel can make static icons on Desktop activating! Let your Desktop become full of energy. WinDeskAngel can make some special effects of text on Windows Desktop(for example, Sunken Text, Raised Text, Light Text, Cloud Text, etc). If you think the text on Desktop is redundant or you do not like any text on Desktop, you can use the feature. It can hide all text on Desktop and only show icons. It is too funny? In Windows, Desktop text is normally white or black. But this feature can let you set any your favorite color for Desktop Text. In Windows XP/2003, if you enable Active Desktop feature, the Desktop text will becore opaque. In such case, visual effects of Desktop is become more sick. WinDeskAngel resolve this probelm successfully. It support make Desktop text transprent even if Active Desktop be enabled. Do you like WinDeskAngel? Download Now!